One of my favorite places to shop for Custom Jewelry is Limoges Jewelry. 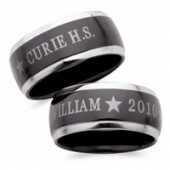 Check out Personalized Class Rings and Graduation Gifts prices starting at ONLY $9.99 - Up to 50% Savings. First time customers will receive an email for 20% Off your first order - no minimum. Free Shipping with $50 use code FREESHIP50 at checkout.